I’m attending a conference in Indianapolis, IN this week. 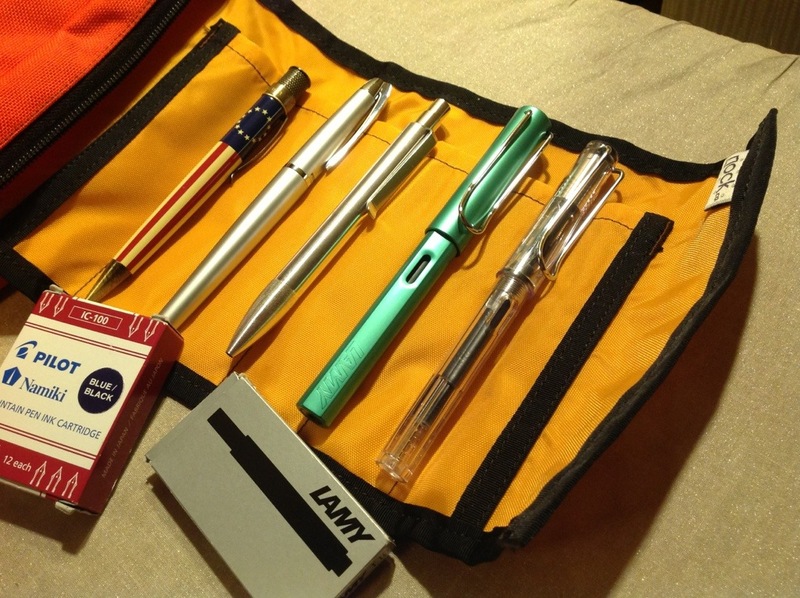 But before I traveled here, I spent a god awful amount of time mulling over which pens to bring with me. Clothes? Easy. Pens? Not so much. Right up until the last minute I was swapping pens in and out of my Nock Co. Brasstown case. The case, at least, was pretty much a given. Even though I schlep three or four Nock Co. Pen cases to and from work every day, I knew I only wanted to travel with one, and the Brasstown quickly made the cut. With its roll-up, multiple pen holding “tongue” and space to carry some ink cartridges and a small ruler, the case was an easy pick. I’m a couple of days into the conference now and have a few thoughts about my choices. The Lamy Vista is great. The EF nib is perfect in my Clairefontaine notebook and I especially like being able to monitor the ink level. The fine nib on the Lamy AL Star is a little broad, while the medium nib on the Pilot Knight is wonderfully smooth and lays down a precise fine line as it’s a Japanese medium. The Fisher Space pen has been particularly handy for filling out entry forms at today’s trade show. It’s easy to carry and completely reliable. Maybe not my favorite refill of all time, but great when you just need a pen to do its job whenever and wherever. I haven’t used Betsy or the Shaker as yet, though both are favorites when I’m home. I think I’ll work them into tomorrow’s sessions. Could it be I have pen A.D.D.? Is that a thing? A couple of other Nock Co. products have really performed well on this trip- the Fodderstack loaded with the DotDash 3×5 cards paired with Nock Co. x Karas Kustoms Exclusive G2 Render K. The pen looks and writes great. I love the playful trio of colors, and loaded with a 0.5 mm G2 refill, it’s been perfect for taking meeting notes AND for keeping track of action items that are popping up at work and at home. By jotting down tasks on the DotDash cards, I’m able to concentrate on what I should be concentrating on- the conference. Someone on Twitter suggested that I should travel with only one pen as a challenge, and I considered that for a little bit. Obviously, I didn’t go that route since I have a stupid number of pens with me. But really, I’m having fun swapping pens from day to day…or even within the same day. And, I must admit, pens are something of a security blanket for me. I feel better when they’re with me. Written and photographed on my iPad and iPhone with poor hotel lighting. But written nonetheless! 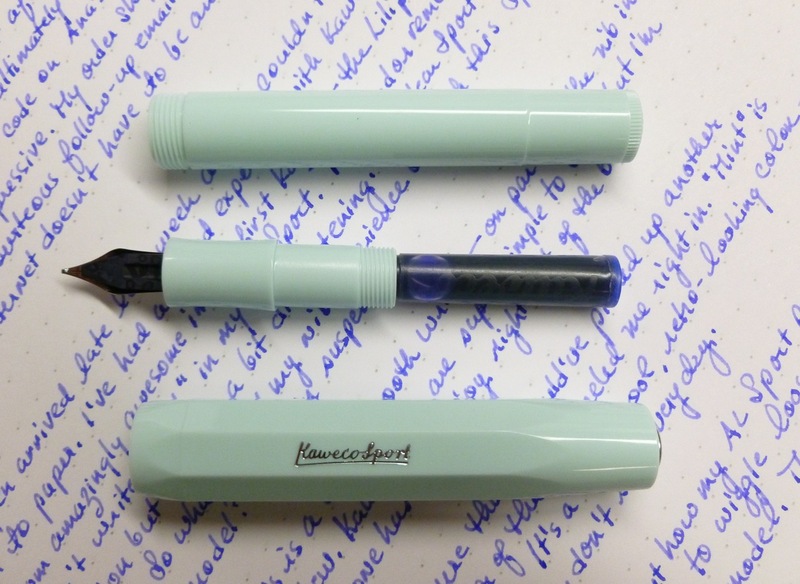 I really wasn’t in the market for another Kaweco, but then I read Ana’s post about the Kaweco Skyline Sport in Mint. MINT! That’s not a pen color that you see very often, and it’s one that reeled me right in. I ordered the pen from Fontoplumo, using the discount code on Ana’s site, and just a couple of hours later received an email saying that my order had shipped. THAT was fast! Frank, from Fontoplumo, also followed up with a genuinely friendly thank you email. Good vibes already, all the way across the ocean. The pen arrived about eight working days later— not bad from the Netherlands— and I immediately popped in the included blue cartridge. I couldn’t wait to put pen to paper. I’ve had mixed experiences with Kaweco nibs— from amazingly smooth in my first Kaweco, the Liliput (EF nib), to “won’t write at all” in my AL Sport (also EF). The vendor remedied THAT problem, but it’s made me leery of the brand. 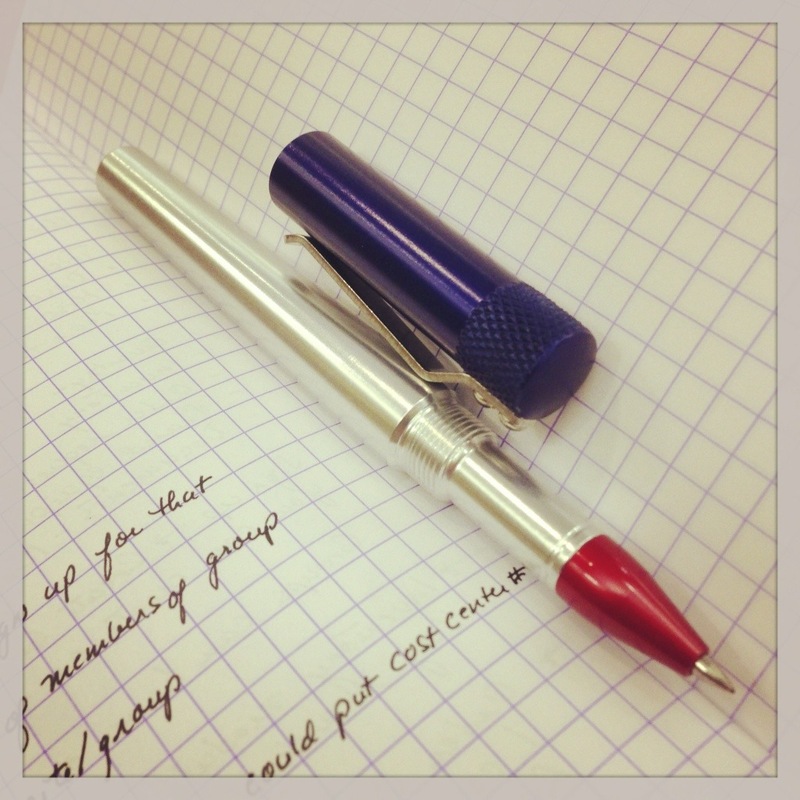 My clear Sport writes nicely, but not as good as my Liliput. 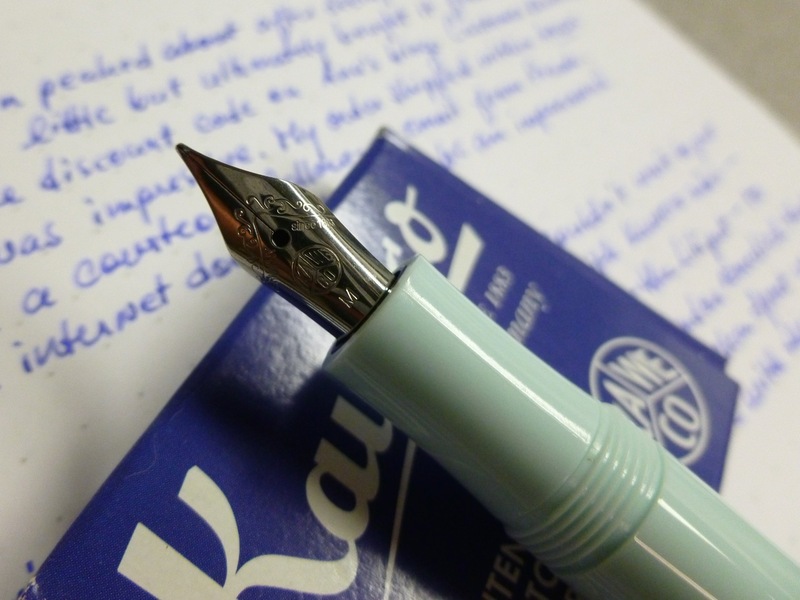 So what would my experience be with this Skyline Sport model and its medium nib? I’m happy to report that this Skyline writes like a dream— smooth, consistent, pleasantly wet— just like my Liliput. Kaweco nibs are inexpensive and super simple to swap, but I’d rather swap nibs because I want to try a different line width than because of a problem. All is well. Phew. This Skyline Sport is, of course, the perfect pocket pen, made even more perfect by the unusual pale mint color. It’s cool. It’s retro. It’s minty fresh. The pen is light (about 10.5 g), but the plastic is sturdy and feels as though it will hold up well. 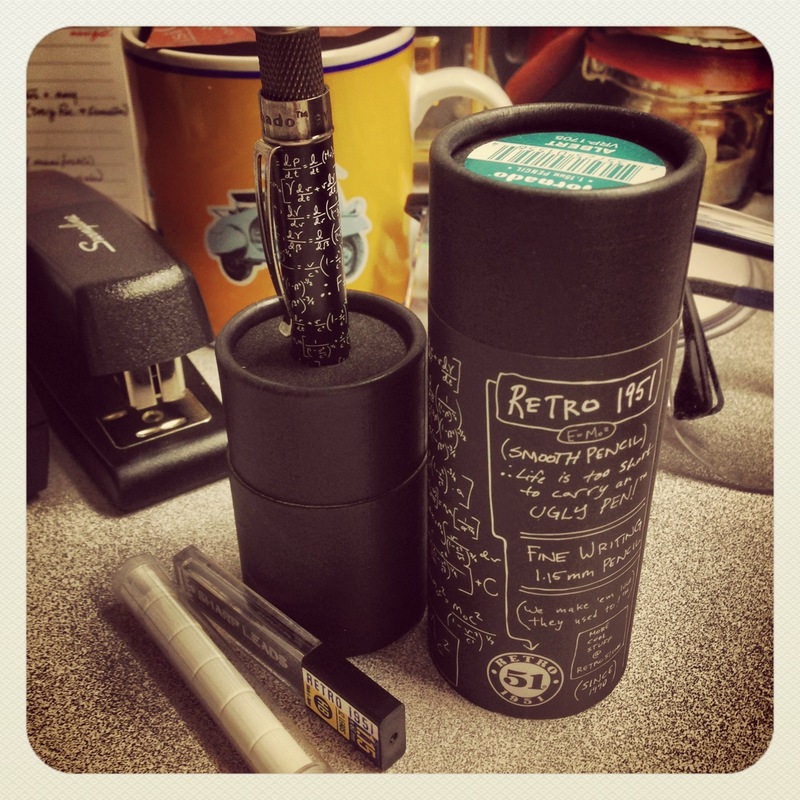 Posted (as it really must be) the pen is almost identical in length to a Retro 51 Tornado. The cap posts securely, better than the one on my AL Sport which always seems to wiggle loose as I’m writing. The plastic on this Skyline Sport is grippier than the metal on the AL Sport so that hasn’t been a problem at all. I plan to stick with cartridges or syringe re-filled cartridges. There’s a mini converter available but I haven’t read many (or any) favorable reviews on that, so sticking with cartridges seems to be the best plan. Despite an iffy experience in the past, this Sport Skyline has me back on the Kaweco bandwagon. Everything about it has been superb— from the quick and friendly service by Fontoplumo, to the smooth and juicy nib, to that cool mint color. 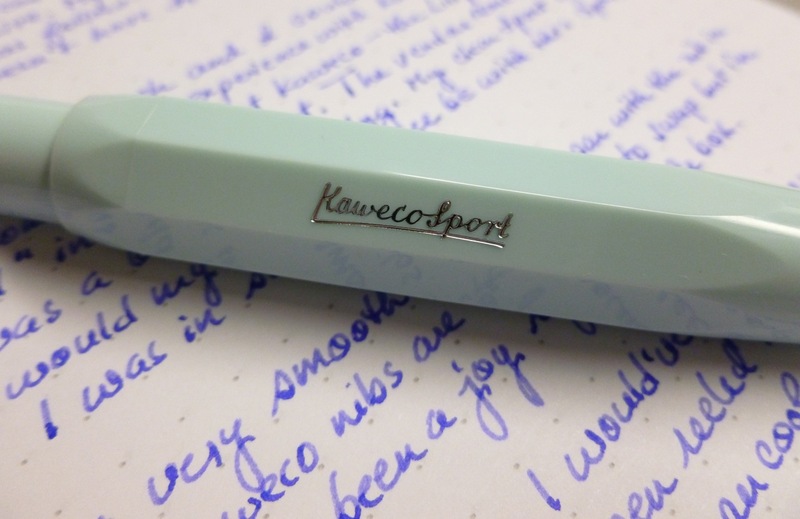 The Kaweco Skyline Sport— it really IS wonderfully refreshing. 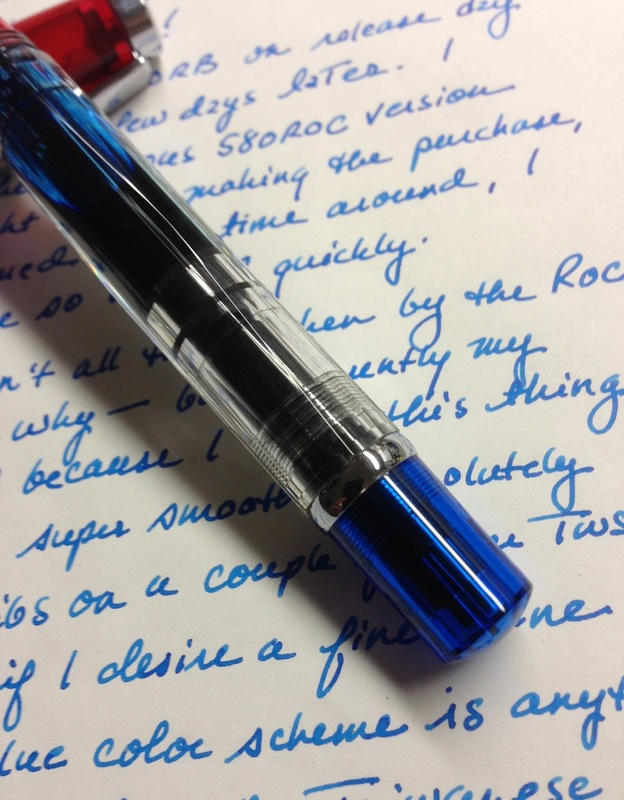 Check out Ana’s review HERE, for her take on the same pen, as well as her Fontoplumo discount code. Full disclosure: The pen reviewed here was sent to me by Chadwick Parker of Big Idea Design, LLC. 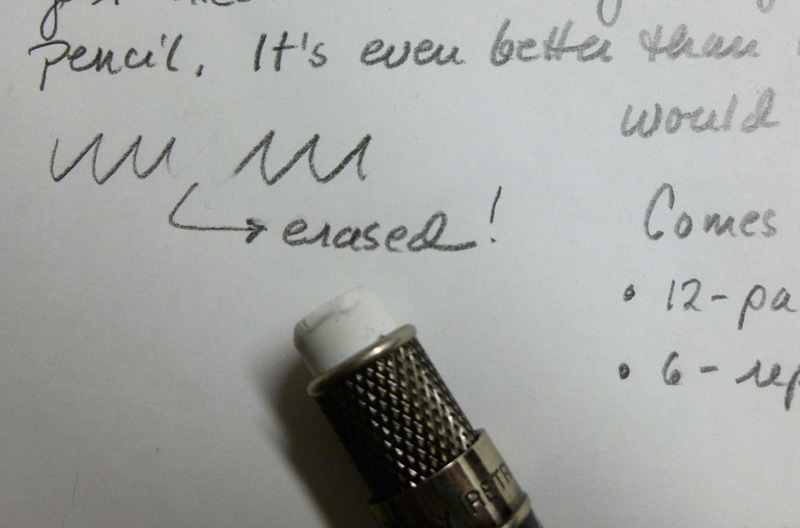 I was not otherwise compensated and this review reflects my observations and experiences with this pen, as well as my previous interactions with Big Idea Design via two of their Kickstarter projects. I’m currently snarled in a couple of Kickstarter projects where the creators appear to have gone AWOL, and that’s disheartening. I’m frustrated enough by these bungled projects to vow that I’ll only back projects by creators who have proven themselves to be seriously committed to delivering quality goods. That list is a short one and includes Chadwick Parker and Joe Huang of Big Idea Designs, LLC. I backed their Solid Titanium Pen & Stylus in 2012, then a follow-up model in 2013, the Ti-Click Pro: Titanium Click Pen + Stylus. Chadwick and Joe love their titanium and they consistently deliver products that ooze quality and attention to detail. Their 2014 offering, the Ti POST RAW Pen + Stylus is just as good as its predecessors— actually, it’s even a little better. That’s what I love about this team— they take the lessons learned from each project and apply them to the their next one— always improving their products, always fine-tuning the details, and always available to provide support in the rare case that it’s needed. I’ve been 110% impressed with their products and how they conduct their campaigns. Chadwick and Joe are the real deal. And so are their pens. Chadwick graciously sent a Ti POST RAW Pen + Stylus my way and it’s another beauty— great looking, great in hand, and a great writer. The pen is solid TA2 titanium with a scratch-resistant finish. I’ve been using this pen for a couple of weeks and so far it looks brand-new. 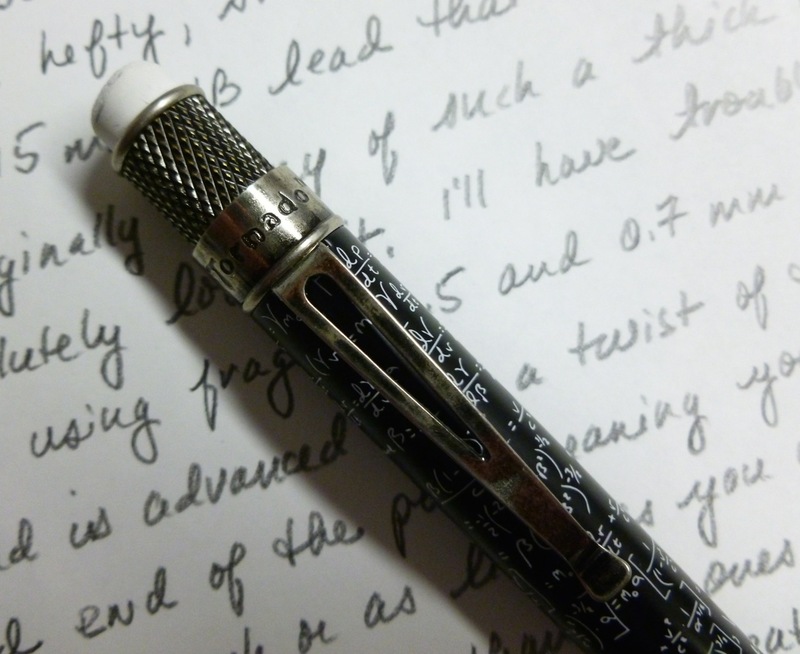 At 36.5g (cap 9.5g, body 27g) this pen has heft, but is well-balanced in hand, whether posted or unposted. The cap posts deeply onto the body, which is a well thought out improvement over the 2012 Solid Titanium Pen which featured a shallowly posting cap that resulted in a pen that felt a little too long. Like I said, they listen, then make improvements. Surely there’s something there that’s a favorite. As I said, I’ve been happy with the refill it shipped with so I haven’t explored this aspect as yet, but it’s nice knowing that I can go to my big box of refills and find something that fits perfectly. The pen also ships with an optional stylus. If you don’t need one, no worries— just leave it in the box. But if you’re someone who switches between analog and digital worlds, it’s a snap to install. Just unscrew the slotted back plug from the end of the pen and screw the stylus in in its place. Now you’re free to take notes on paper OR on an electronic device. All bases are covered. There is a decent sized step down from the pen barrel to the grip area, but the grip is long enough that I doubt this’ll cause an issue for anyone. The grip is nicely tapered and features three grooves to add a bit of traction. I’ve haven’t experienced any issues with my fingers slipping as I write. The clip is solid and springy, with an improved profile over the two earlier models. On those pens, the end of the pen curved inward towards the body of the pen, whereas on this pen, the end of clip is curved away from the pen body. This improvement makes the Ti RAW POST Pen + Stylus easier to slide into a pen case or pocket. It’s another example of how Joe and Chadwick take the details seriously. Branding is super subtle— just their characteristic “Ti” logo on the pen’s clip. It’s branding that’s clean and simple and doesn’t interfere with the pen’s industrial good looks. 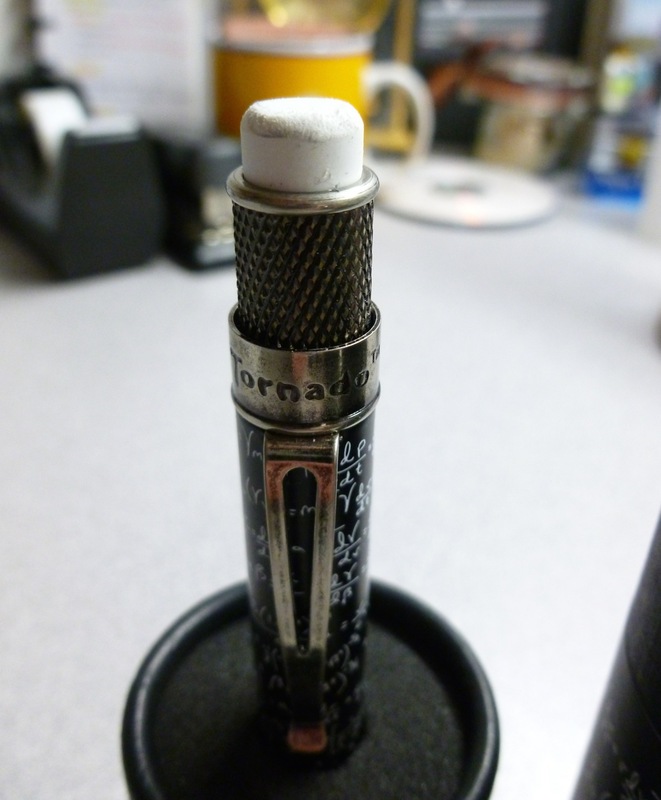 After their Solid Titanium Pen + Stylus pen shipped, a niggly problem cropped up for some of us where certain refills stopped working, possibly because they were hitting the inside of the cap. As the feedback rolled in, Chadwick and Joe jumped to action, remade the front section of the pen, and shipped it out to anyone who was having a problem, myself included. They listened and they acted quickly and decisively— simple as that. This is a team that builds trust AND great pens. The Kickstarter project for this pen has been completed, but you can order the Ti POST RAW Pen + Stylus, or any of their other offerings, at bigidesign.com. Note that they offer free worldwide shipping along with a zero risk, 14-day 100% money back guarantee. 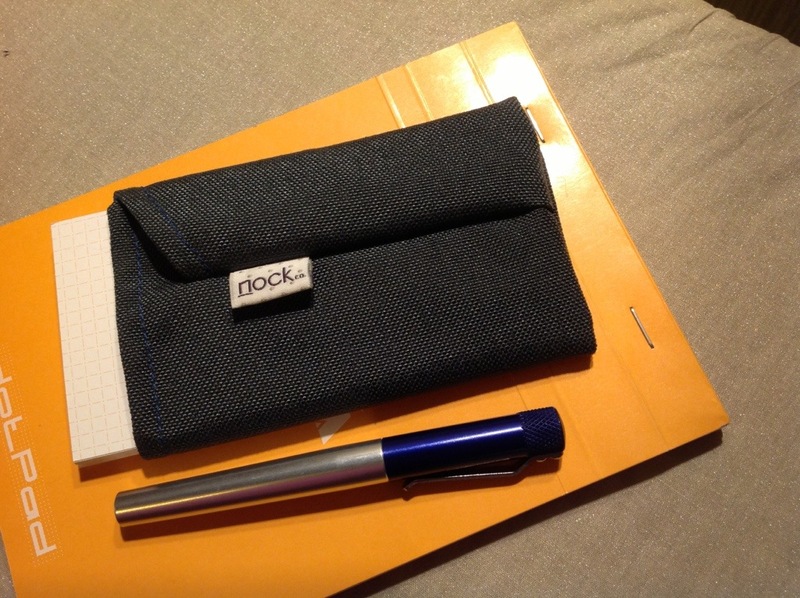 A felt pen sleeve is included. This is a fine pen brought to you by a fine team. They are, simply put, a class act. It’s no secret that Physics and I have had a rocky relationship. All I can say as far as college Physics goes is, “Thank God for a smart lab partner.” My seat in the lecture hall was in the WAY back (alphabetically arranged) which didn’t help my precarious grasp on the formulas and theories that the professor tried to jam into my head. I got through…somehow. This was not my finest hour, academically speaking. 1) One of my favorite childhood activities was writing and drawing on the blackboard in our playroom. Every now and then my father would apply a fresh coat of blackboard paint so the surface was restored to a deep dark finish. Fresh chalk on a smooth blackboard. Nothing better. I love where I work, so maybe, this pencil with its blackboards and formulaic scribbles makes me feel at home even though I don’t understand a whit. Whatever the reason, I love this pencil. It’s my first one from Retro 1951, though I’d been eyeing the all-black stealth model for awhile. 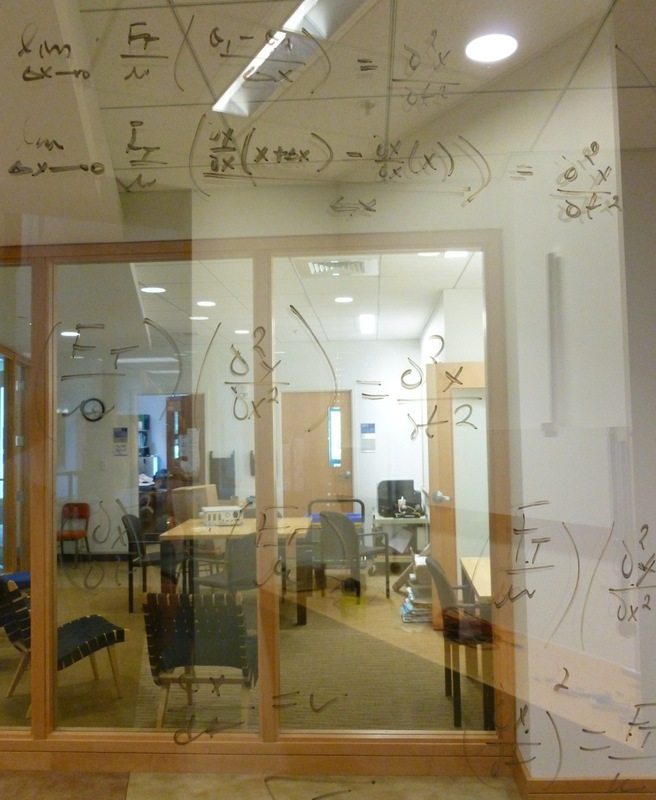 Even though that one looked cool, I like this one with Albert Einstein’s formulas scribbled on a blackboard even better. The iconic Tornado knurling holds the pencil’s substantial eraser. And this eraser ERASES! No smudgy business going on here. The eraser feels soft and is big enough to handle even my Physics-sized mistakes. A twist of the knurled section advances the beefy 1.15 mm HB lead, which means that you can advance exactly as much or as little lead as you like. You’re not at the mercy of a click-to-advance system that often extends too much or too little. The mechanism works without a hitch and the lead is luscious. At first I was leery of such a thick lead, but I absolutely love it. I’ll have trouble going back to those fragile 0.5 and 0.7 mm leads. The pencil itself is hefty and smooth feeling, not unlike the Makrolon body on the Lamy 2000 writing utensils, but without even that HINT of texture. This is pure smoothness. It feels so good in hand that I find myself using it when I’d typically use a pen. And that’s saying something. I was pleasantly surprised to find that the Albert pencil comes with a 12-pack of 1.15 mm HB lead as well as a 6-pack of replacement erasers, meaning that I’m set to write and erase for a good long time. Though Physics was not my thing, this Albert pencil by Retro 1951 is. With its slick blackboard look covered with Einstein’s tidy formulas, I can’t help but feel smarter for owning it. Professor Lapetina, though, might beg to differ. I think I was JUST discovering the TWSBI brand back when the first incarnation of this pen— the TSWBI 540 ROC 100— was around. At the time I was enamored with the TWSBI Micarta which couldn’t be more different than this pen. I remember seeing the ROC and thinking that the color scheme wasn’t really my thing. And so I passed. And then it was gone. Which immediately made me want it. Well played, TWSBI, well played. 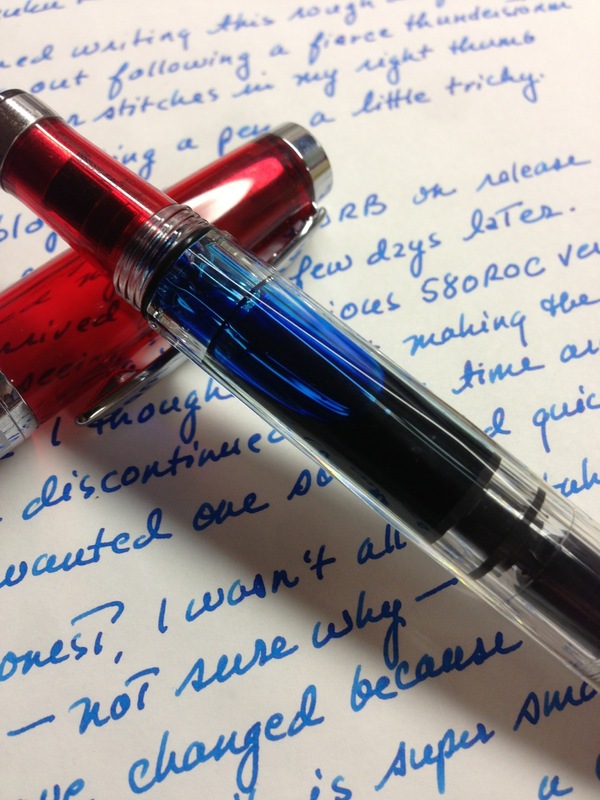 So when TWSBI recently released the TWSBI 580RB with the same red/clear/blue color scheme, I pounced on it on launch day. 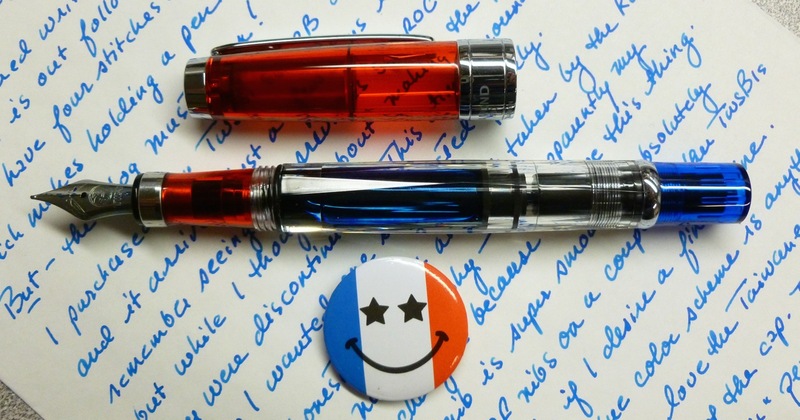 It’s a patriotic looking pen, but not necessarily applicable to just the USA. The cap features the “Blue Sky with White Sun” Taiwanese flag symbol. 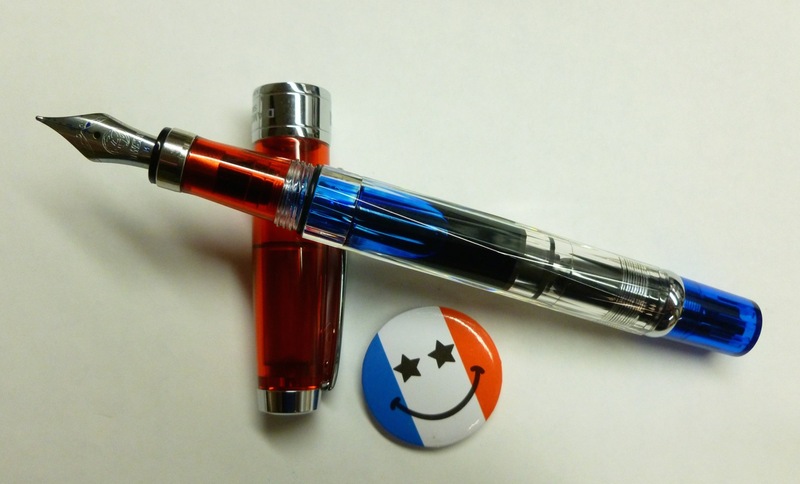 Though a version sporting a US flag design is promised, I prefer seeing this sun on the end of my pen. I’m patriotic(ish), but more in a “Give me your tired, your poor…” way than the “We’re #1! !” kind of way. The pen, at first glance, might seem like it’s screaming “USA, USA” but there SO MANY countries with red, white, and blue flags, that it could actually be considered multi-cultural. When I was fascinated with the organic and muted look of the TWSBI Micarta, the 580ROC looked garish, but now I enjoy its eye popping red cap and section and blue blind cap. 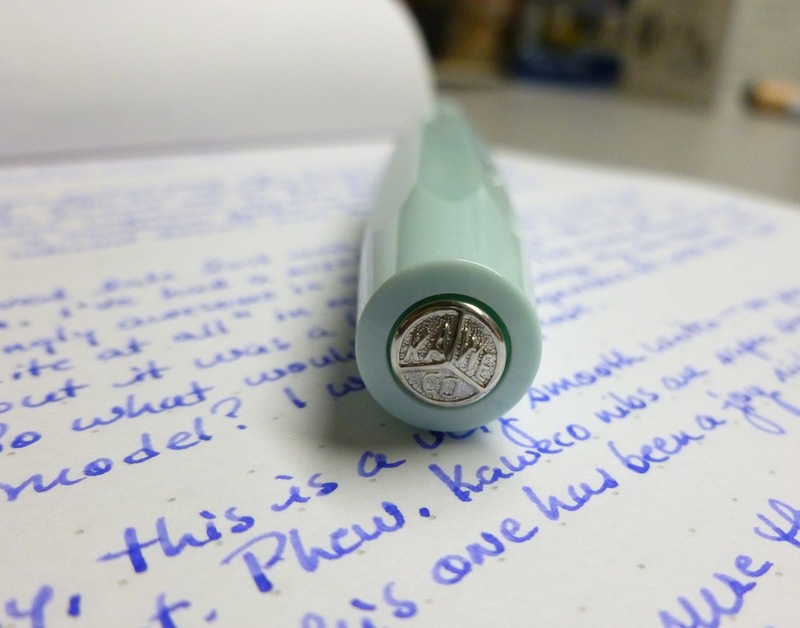 I’ve filled mine with Iroshizuku kon-peki which is a dead ringer for the pen’s blue accents. The piston filler works smoothly and makes the pen a breeze to clean. 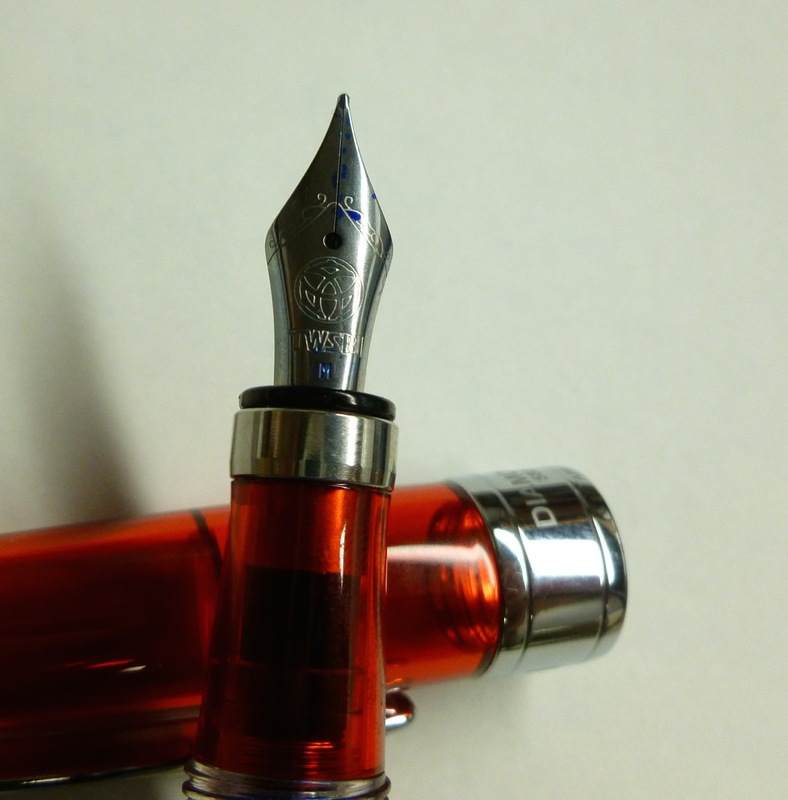 The pen is available in fine, medium, and broad— no stub as yet— but a spare TWSBI stub nib unit could be swapped in. I chose the medium nib which writes very smoothly with excellent flow. I couldn’t be happier with the way this steel nib performs. I have a couple of other TWSBIs with EF nibs that I can swap in should I desire a finer line with this pen. I also have a 580 with a 1.1 mm stub, so I’ve got the nib range pretty well covered. The pen’s clip is firm but functional. The branding— etched lettering on the cap’s band— is simple and clean. The cap doesn’t post. Well, technically you can jam the cap on the end of the pen, but it’s not a good look or feel. This isn’t an issue for me as the 580RB’s uncapped length of 5-1/8 inches makes it the perfect size for my average-sized hand. While the pen’s red section is round and nicely tapered, the clear body is faceted, which gives the pen the “Diamond” moniker. I get endless amusement from watching the kon-peki slosh around in the pen body. Simple pleasures— or a simple mind?! It’s a cool look and makes monitoring the ink level a snap. 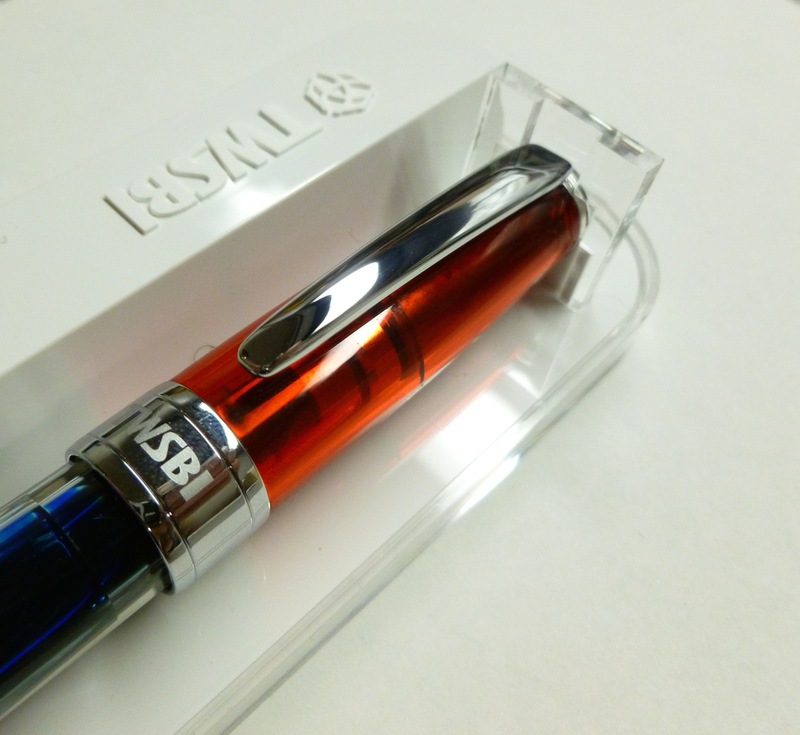 While I was asleep at the wheel when the TWSBI 540 ROC was available, and lost out on a chance to acquire that pen, I was wide awake when TWSBI launched the 580RB. 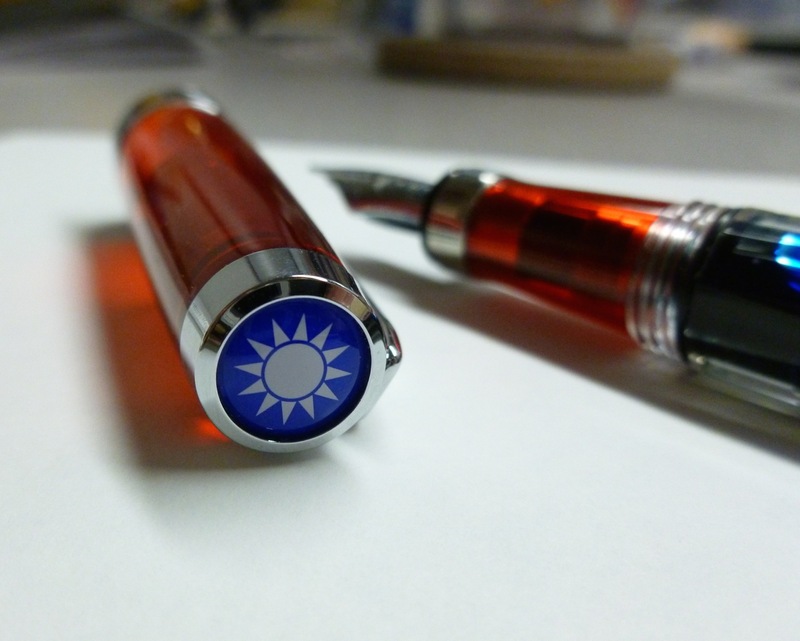 While not a pen for everyone in terms of color-scheme, I personally love the look of this pen that celebrates its Taiwanese roots with the cap’s charming sun design. And whether you’re American, Chilean, Norwegian, French, or Slovakian, the 580RB’s red, white (clear), and blue colors will remind you of your country’s flag and history. We’ll celebrate the 4th of July here tomorrow with cook-outs, parades, and fireworks, and lots of red, white, and blue decorations. My favorite one will be this pen. Thank you, TWSBI, for the second chance to own this pen with a decidedly global vibe. I like to think of the TWSBI 580RB as a pen that reminds us we’re all in this together. Peace, friends.